MongoDb installation packages are available for both 32 bit and 64 bit Linux. You can download it, and install. After downloading the zip file, unzip it to the folder where you want to install. 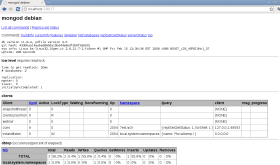 MongoDb stores data in db folder within data folder. But, since this data folder is not created automatically, you have to create it manually. Remember that data directory should be created in the root (/). 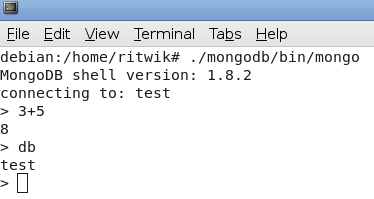 To run MongoDb server from command prompt, you have to execute mongod.exe file from bin folder of mongodb folder. db command will show you the list of documents(databases). We will insert a simple record and retrieve the data now. 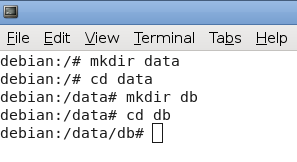 The first command inserts 8 to the z field, to the w3r collection(table). At a port number 1000 more than the port on which the MongoDb server is running, you can access a web interface of MongoDb. If MongoDb is running at the default port 27017, the you can access the web interface at 28017.